293 in stock Need More ? Nominated for the CILIP Carnegie & Kate Greenaway Children's Book Awards 2018. 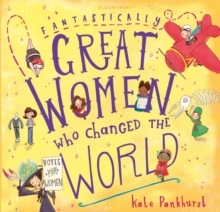 Kate Pankhurst, descendent of Emmeline Pankhurst, has created this wildly wonderful and accessible book about women who really changed the world. The perfect gift for the Fantastically Great Women in your life. Discover fascinating facts about some of the most amazing women who changed the world we live in. Fly through the sky with the incredible explorer Amelia Earhart, and read all about the Wonderful Adventures of Mary Seacole with the number one best-selling children's non-fiction title in the UK market this year.